Take maida, add salt and 2 teaspoon oil and knead dough. Keep it hard. Take besan, add salt and 1 teaspoon oil and knead dough. 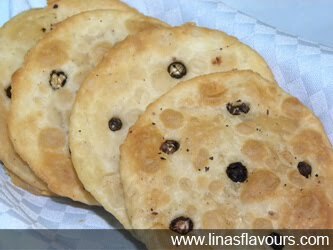 Make small balls from maida and besan separately. Roll two puris from maida of about one inch diameter. Roll one puri from besan dough of one inch diameter. Put one puri of maida, next besan and on the top maida puri again. Arrange pepper corns on the top and slightly press it with pestle. Prepare all the puris. Let it dry till all the puris are made, it will turn out to be crispy when fried. Take kadai/frying pan and heat oil. Deep fry all the puris till it turns out light brown. Let it cool. Store it in the air tight container and use it whenever you like it.